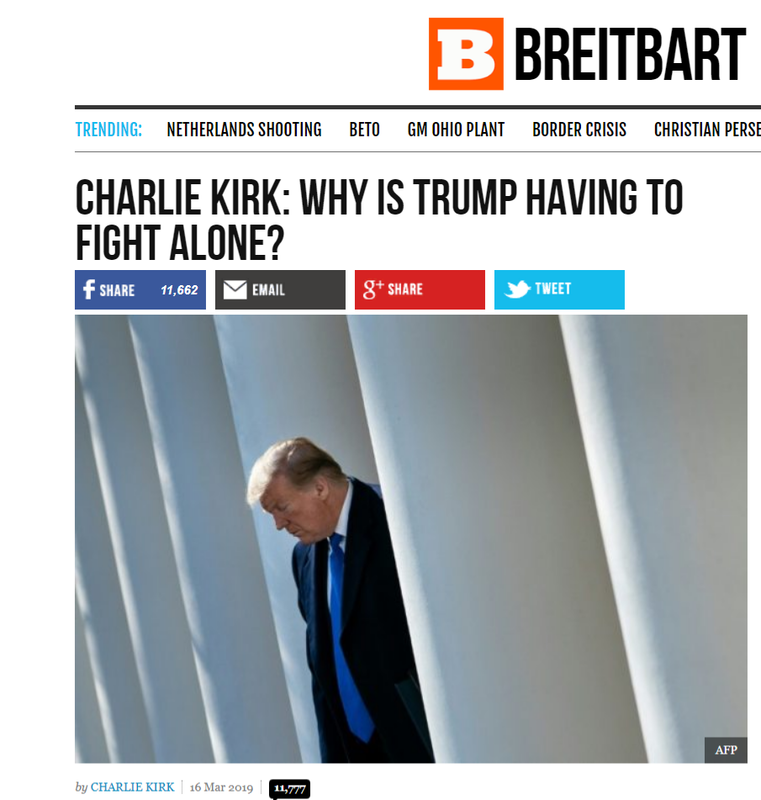 Charlie Kirk, founder and president of Turning Point USA, wrote an op-ed for Breitbart News on March 16. In time for Lent, its theme was Trump is a Jesus-like hero, a particularly solitary figure abandoned by everyone but the truly courageous. It is a crude act of Christian nationalism that is common for Kirk. This theme is disturbing in itself. But first, some fact checks of what Kirk wrote. H.J.Res. 46 is not technically a bill, but a joint resolution, though “there is no real difference between a joint resolution and a bill,” according to the Senate website. Both categories of legislation have to pass through Congress and be signed by the president, though the resolution doesn’t become law. The “they” here is Congress, specifically the GOP-controlled Congress from 2017–2019. It also seemingly includes the Democrat-led House from January until now. Kirk claims that these two groups “did nothing” to secure the southwest border. In fact, in February, three weeks after a government shutdown ended, a $333 billion spending bill Congress approved and the president signed included “$1.375 billion for 55 miles of new fences along the border in Texas…” But this was “far short of the $5.7 billion Trump had sought for 234 miles of steel walls,” according to The Washington Post. In 2018 the GOP-led Congress approved a $1.3 trillion budget that “included $1.6 billion for some projects at the border…. “ but “none of that can be used toward the border wall promised during the presidential campaign,” according to Politifact. Kirk implies the president didn’t pursue legislation or funding that would force the GOP to vote against it. This is an odd and factually inaccurate argument, based on the budget deal the GOP and the president signed before the Democrats took over the House. But now that the Democrats control the House, Trump can pursue those bills and funding and force a shutdown “on” the Democrats. Yet also Kirk blames the GOP-led Congress for “doing nothing” yet paints Trump as polite enough to not force the “do nothing” Congress to look bad by voting against his wishes. So Kirk would have the GOP-led Congress do nothing rather than vote against the President but then Kirk attacks the lack of action. Head-spinning sycophancy there. Also, in advocating for the need for the emergency declaration, Kirk commits a fatal flaw: he admits Trump’s run-around of Congress. “For two years the President had a majority in the House and in the Senate and tried to rely on them to cooperate in getting our border secured,” Kirk wrote. Trump has in fact declared a national emergency because he did not get what he wanted from Congress. Kirk seemingly accepts this flaw because he can use it to attack the 12 GOP senators who voted to terminate to the president’s declaration. Whether the declaration is legal or constitutional, it would seem from Kirk’s own words that the emergency is not real because no president would wait two years to declare it if it was indeed an emergent situation. With this move, Kirk tries to cover his own sins. It is clear Kirk doesn’t draw accurate conclusions or even name the polling questions accurately. This entire claim also echoes what Kirk wrote at the beginning of the op-ed: “… any elected government leaders other than President Trump, are willing to stand up for the beliefs and intentions of a majority of Americans.” We can assume here that the “beliefs” and “intentions” are the importance of border security and the desire to build a border wall. The key fact error here is “contrived.” Kirk has long derided the Mueller investigation, echoing Trump’s “witch hunt” and “presidential harassment” false statements. Here with an adjective that can be defined as “deliberately created rather than arising naturally or spontaneously” Kirk errors again. The investigation into Russia election interference arose because of statements and actions by Trump campaign operatives that predated the Mueller investigation’s legal opening, actions and statements that raised the eyes of the FBI. Such an investigation then rose “naturally” from the suspicions about those actions. As usual, Kirk is trying to rhetorically reverse labels thrown at Trump back onto the Mueller investigation, and more broadly, the Democratic party. Tweed has many similarities to Trump — hiring friends, voter suppression, fraud by campaign officials, and of course, emoluments. But he also frames his entire op-ed in terms of the Christian gospel story of the last week of Jesus and the defection of his 12 disciples. In the end, they all forsook him and fled. We have the classic plotline of one solitary figure standing up against a unified threat. In traditional literature, the story usually ends tragically. Kirk is implicitly saying that Trump is Jesus. Others have used different biblical figures to describe Trump. In short, those others paint Trump as a “vessel” for God. Kirk takes a short but important leap to Trump as Jesus, who was also a kind of vessel. So then the question is: how does this lack help Kirk focus his faith and bring him closer to Trump as the Jesus figure? A focus on Trump as Jesus and his courage helps Kirk grow closer to Trump as Jesus and helps Kirk gain more courage. In the Christian gospels and scriptures, the “elect” can be a small number or it can be a big number. Kirk here is implying it can be a democratic majority. This is Christian nationalism at its clearest.